Sony A57, A77, A99,A6000 ,A6300, A65, A55, A33, A7, A7S, A7R, A7R II,A77II, A7S II. Sony NEX-7, NEX-6, NEX-5N, NEX-5R, NEX-5. Sony A230, A290, A330, A380, A390, A450, A500, A550, A560, A580, A700, A850, A900, etc. Fujifilm: GFX 50S, GFX 50R, X-H1, X-Pro2, X-T3, X-T2, X-T1, X-T20, X-T10, X-T100, X-E3, X-E2S, X-E2, X-A5, X-A10, X100F, X100T, X70, X30, XF10. The system works at 433MHZ frequency and has 16 available channels. There are 16 codes available, so you can use one transmitter with multi-receivers. Product model: JM-RII for Fujifilm RR-90. Compatible with Fujifilm GFX 50S, X30, X70, X100F, X100T, X-A1, X-A2, X-A3, X-A10, X-E2, X-E2S, X-E3, X-M1, XQ1, X-Pro2, XQ2, FinePix S1, X-T1, X-T2, X-T10, X-T20. 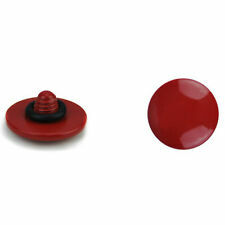 This series soft release buttons are divided into two different shapes- concave surface and bulged surface. There are three colours available for you now. 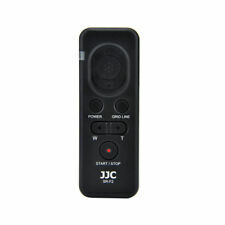 JJC SRB-C11 Dark Red Soft Shutter Release Button with Concave Surface. Ft 2, FZ100, FZ15, FZ150, FZ20, FZ200, FZ30, FZ50, FZ300, FZ330, FZ1000, FZ2000, FZ2500. to 99 hrs., 59 min., 59 sec. The maximum number of programmable shots is 399 or you can set it to unlimited. Suitable for Panasonic. To 99 hrs., 59 min., 59 sec. The maximum number of shots is 399. EOS 550D, 500D, 450D, 400D, 350D, 300D, 100D. EOS 1500D, 1300D, 1200D, 1100D, 1000D. EOS 760D, 750D, 700D, 70D, 650D, 600D, 60D. EOS 200D, 77D, M6, M5, 8000D, 800D, 80D. 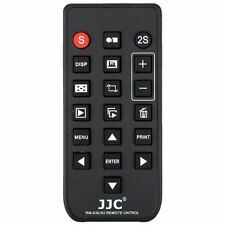 JJC MA-R2 Wired Remote Switch x 1. Fujifilm: GFX 50S, GFX 50R, X-H1, X-Pro2, X-T3, X-T2, X-T1, X-T20, X-T10, X-T100, X-E3, X-E2S, X-E2, X-A5, X-A10, X100F, X100T, X70, X30, XF10. Press the shutter button halfway to focus. To 99 hrs., 59 min., 59 sec. The maximum number of programmable shots is 399 or you can set it to unlimited. EOS 5D, 5Ds, 5Dsr, 5D mk II, 5D mk III, 5D mk IV. EOS 6D, 6D mk II, 7D, 7D mk II. EOS 10D, 1D, 1D mk II, 1D mk II N, 1D mk III, 1D mk IV. The system works at a 433MHZ frequency and has 16 available channels. The receiver has a 1/4"-20 tripod mount socket on the bottom, so you can even mount the receiver onto a tripod. The receiver itself with the connecting cable can be used as a Wired Remote Switch, then half press to focus, full press to take a photo. The pistol-style grip features finger grooves for ergonomic operation. Product model: HR Pistol Grip Remote. Product model: Pistol Grip DC0 Kit. D850, D800, D800 E, D810, D810A, D500, D700. The pistol-style grip features finger grooves for ergonomic operation. D3, D300, D300S, D3, D3s, D3X, D4, D4s, D5. D1, D100(with MB-D100 battery grip), D1H, D1X, D2, D200, D2H, D2HS, D2X, D2XS. D3100, D3200, D3300. D5000, D5100, D5200, D5300, D5500, D5600. The pistol grip by JJC is particularly comfortable to hold due to its ergonomic design and allows an especially spontaneous use of your DSLR due to the integrated trigger. 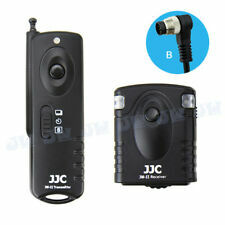 Compatible with Fujifilm Finepix HS50EXR. The pistol-style grip features finger grooves for ergonomic operation. D600, D610 D750, D7000, D7100, D7200, D7500, D90, Df. Product model: Pistol Grip DC2 Kit. The working distance of SR-F2 is up to 1m / 3.28'. It allows you to record movie / still images without vibrations. 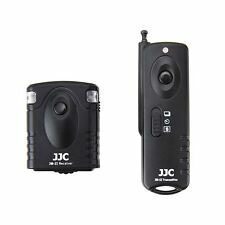 With locking function, JJC-SR-F2 is ideal for Bulb long exposure and successive shots. 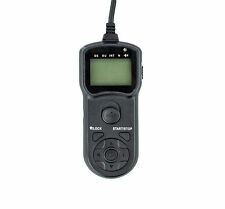 Remote Shutter Release switch for Olympus RM-UC1 OM-D E-M5 E-620 600 P2 SP-590UZ. 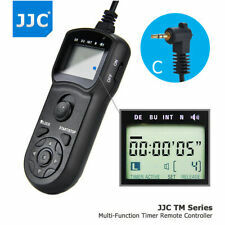 1x JJC Remote Shutter Release (replace Olympus RM-UC1). Olympus OM-D E-M1, E-M5, E-M5 Mark II, E-M10,E-M10 Mark II. Olympus E30, E100, E400, E410, E420, E450, E510, E520, E600, E620. 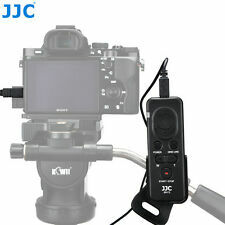 1 x JJC HR-DV handle pistol grip with 2 cables for Sony camcorders with A/V R or LANC port and BMPCC. The pistol grip features finger grooves for ergonomic operation. There’s a 1/4"-20 thread at the bottom of the handle, which allows you attach your mounted camcorder to a tripod or head. The pistol-style grip features finger grooves for ergonomic operation. EOS 6D, 6D mk II, 7D, 7D mk II. EOS 5D, 5Ds, 5Dsr, 5D mk II, 5D mk III, 5D mk IV. Product model: Pistol Grip N3 Kit. EOS 10D, 1D, 1D mk II, 1D mk II N, 1D mk III, 1D mk IV. A6500, A6400, A6300, A6000, A5100, A5000, A3000. RX100 II, RX100 III, RX100 IV, RX100 V, RX100 VI. Product model: JJC MA-F2. JJC cable MA-F2 cable switch x 1. A9, A99 II, A58, A68, RX10, RX10 II, RX10 III, RX10 IV. A6500, A6400, A6300, A6000, A5100, A5000, A3000. RX100 II, RX100 III, RX100 IV, RX100 V, RX100 VI. The cords fits for the following JJC remotes A7, A7 II, A7 III, A7R, A7R II, A7R III, A7S, A7S II, A7S III. To 99 hrs., 59 min., 59 sec. The maximum number of programmable shots is 399 or you can set it to unlimited. D1, D100(with MB-D100 battery grip), D1H, D1X, D2, D200, D2H, D2HS, D2X, D2XS, D3, D300, D300S, D3s, D3X, D4, D4s, D700, D800, D800 E, D810. A6500, A6400, A6300, A6000, A5100, A5000, A3000. RX100 II, RX100 III, RX100 IV, RX100 V, RX100 VI. The system works at a 433MHZ frequency and has 16 available channels. The receiver has a 1/4"-20 tripod mount socket on the bottom, so you can even mount the receiver onto a tripod. In excellent condition and in full working order. In original box. OM-D E-M10 Mark II, OM-D EM5, OM-D EM1, OM-D EM10. to 99 hrs., 59 min., 59 sec. The maximum number of programmable shots is 399 or you can set it to unlimited. E400, E410, E420, E450, E510, E520, E600, E620, E30. Fujifilm: GFX 50S, GFX 50R, X-H1, X-Pro2, X-T3, X-T2, X-T1, X-T20, X-T10, X-T100, X-E3, X-E2S, X-E2, X-A5, X-A10, X100F, X100T, X70, X30, XF10. It is excellent for flower blooming, sunset, moonrise, etc. photography. 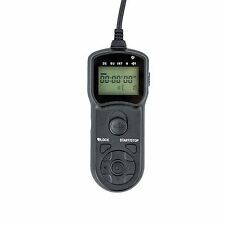 There is a small shutter release button on the remote, on the side of the remote is the function selector(s), on the back of IS series remote is the function label. Besides, it is easy to operate and convenient for carrying. 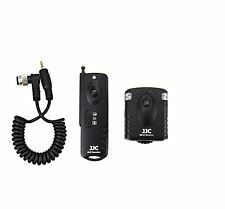 Fujifilm FinePix HS Series: FinePix HS20EXR, FinePix HS22EXR, FinePix HS25EXR, FinePix HS28EXR, FinePix HS30EXR, FinePix HS33EXR, FinePix HS35EXR. Fujifilm FinePix S Series: FinePix S100fs, FinePix S20 Pro, FinePix S200EXR, FinePix S9000, FinePix S9100, FinePix S9500, FinePix S9600. Sony A7, A7R, A7S, A7 mk2, A7s mk2, A7R mk2, A7 mk3, A7R mk3. Sony NEX5, NEX 5N, NEX 5R, NEX 6, NEX 7, NEX 5T, A6300, A6400. There is a small shutter release button on the remote, on the side of the remote is the function selector(s), on the back of IS series remote is the function label. Canon EOS 1300D/1200D/1100D/1000D/760D/750D/700D/650D/600D/550D/500D/450D/400D/350D/300D/100D/80D/70D/60Da/60D/50E/50 (Rebel, Rebel XT, Rebel XTi, Rebel XSi, Rebel XS, Rebel T1i, Rebel T2i, Rebel T3i, Rebel T6S, T6I EOS Kiss X70 Kiss 8i, EOS 8000D). Sony Alpha A6500, A6400. 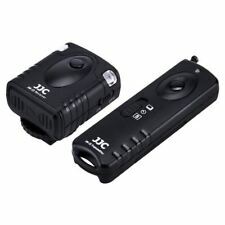 JJC ES-A6500 Eye cup (Black) x 1. The Eyepiece is designed to seal out stray light for improved viewfinder optics. Made of soft TPU rubber, it protects your eyes from scratches, especially for eyeglass users. Nikon D Series - D7500/ D7200/ D7100/ D7000 / D5300/ D5200/ D5100. 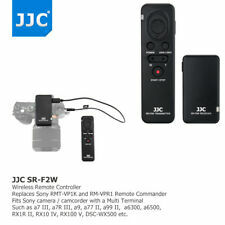 JJC RM-E2 IR remote x 1. Nikon D Series - D3300/ D3200/ D3000 / D750/ D610/ D600. Nikon D Series - D90/ D80/ D70s/ D70/ D60/D50/ D40x/ D40. To 99 hrs., 59 min., 59 sec. The maximum number of programmable shots is 399 or you can set it to unlimited. S1, X-A1, X-A3, X-M1, X-T1, X-T2, XQ1, X30, X100T, X-E2, X-E2S, X70, X-Pro2, X100T, X-T10. GFX 50S, X30, X70, X100F, X100T, X-A1. 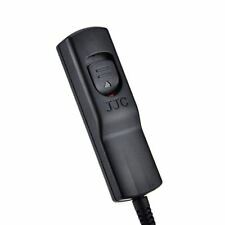 1 x JJC MA-R Shutter Release Cable for Fujifilm as RR-90. Pressing the shutter button halfway enables focusing; pressing the shutter button all the way down releases the shutter. JJC Soft Release Button for Fujifilm Fuji X100F X-T20 X-T30 X-T3 X-T2 X-PRO2 X100T X-E3 XPRO-1 X-T10 X100 X100S X-E2S X30 X20 X10. [Compatibility] JJC soft release button is designed for Fujifilm X-T30 X-T20 X-T10 X-T3 X-T2 X-PRO1 X-PRO2 X100 X100S X100T X100F X30 X20 X10 X-E3 X-E2S. The Soft Release Mount Screw attaches to flat shutter button and provides a female thread for you to use. Soft Release Mount Screw is crafted from premium brass, compact and durable. 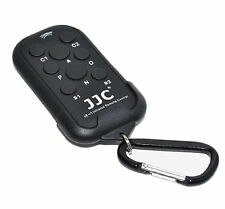 JJC SRB-C11BK black soft release button x 1. This series soft release buttons are divided into two different shapes- concave surface and bulged surface. There are nine colors available for you now. 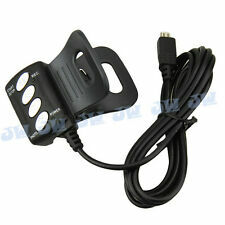 JJC SRB-C11BK concave surface Soft Release Button - Black x 1. Canon EOS DSLR - 800D/ 760D/ 750D/ 700D/650D/600D. 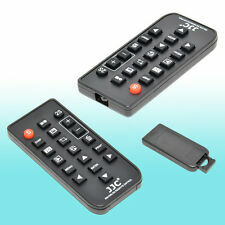 JJC RM-E6A IR remote x 1. Canon EOS DSLR - 7D/ 7D Mark II/ 6D / 6D Mark II/ 5D Mark III/ 5D Mark II. Canon EOS DSLR - 550D/500D/450D/400D/350D/300D/200D/100D. The soft release buttons are made of brass. 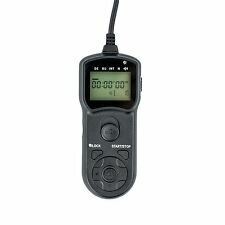 Just screw the soft release button into shutter release button's threads and you will enjoy the soft and steady shutter release operation. This is a kit included a 40cm Red Threaded Cable Release and a Convex Surface Red Soft Release Button. This series soft release buttons are divided into two different shapes- concave surface and bulged surface. There are nine colors available for you now. 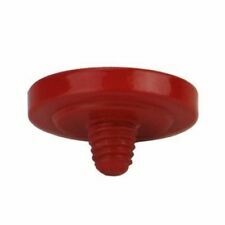 JJC SRB-C11R Soft Release Button concave surface - Red x 1.